We all take Pi for granted. It’s loaded into our computers and calculators for us, and we use it in equations all the time without ever thinking of it beyond it's formulaic utility. 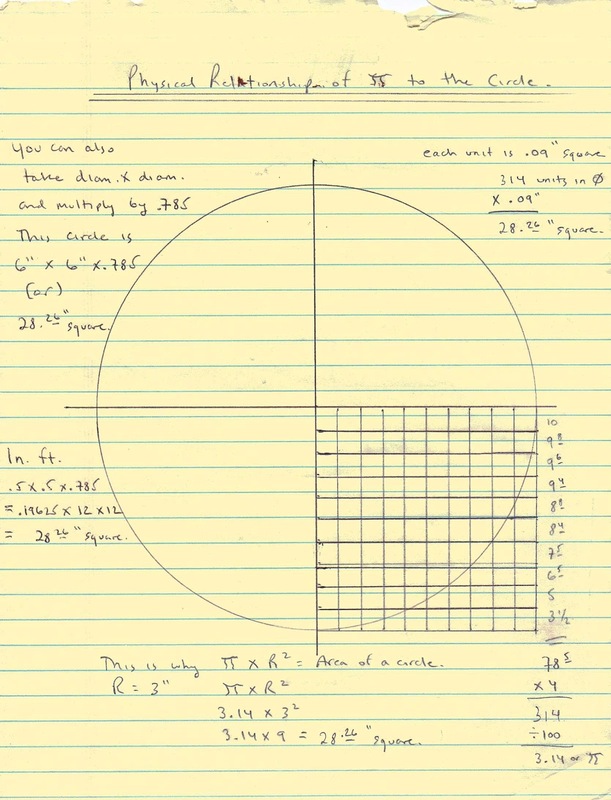 Some years ago, while working as an estimator of utilities, I found it necessary; or maybe desirable; to understand the exact meaning of Pi and how it worked in relation to the circle. Having failed at the subject all through high school, and even before that, I had this “fear” of math brought on by my parent’s assertions that I was not able to understand the subject. I was, like my mother; and remember, it was my mother who said it; used to tell me, “You take after me and I could never understand math. But you can read well, and your brother can’t.” What a stupid statement to make to any child, even your own! Water under the bridge. Having navigated around the world, by sextant, in the days before Nav Sats etc., I can truly say that I am perfectly capable of working out any mathematical problem thrown my way. The failure was in the teaching method. Had they wanted to really engage my passion all they would have had to do was make the problems relevant to real life. Like, you are on a ship and headed in this direction for 8 days at so many mils per hour. How far have you gone? That would have got me interested. And by high school, rather than the mundane tasks of geometry and trigonometry, nautical astronomy would have proven more effective at teaching not only both of those subjects, but given the student a true perspective of just where we were on the terrestrial plane, and also how insignificant we actually are; individually, or collectively, in the grand scheme of things. What is Pi? 3. 14159 is the most common answer. Then browse Wikipedia for what that means. Ask the “math” student in your family. The answers you get will all be concerned with the number rather than what it really means, or stands for. That was the purpose of charting it, as I did above, almost 40 years ago while estimating the volume of pipe necessary to hold a specific amount of water. I used a 6” pipe for the example, mostly because it was easily equated to decimal form, and I had a boatload of 6” pipe on hand. But I kept running into Pi while figuring it out, and then rechecking my figures. So, I did what Captain Ellison used to tell us at the Baltimore School of Navigation; “Draw it out!” And, I did. And while putting some of my papers in order a few years ago; I actually did that; I ran across this and decided to post it for posterity. In short, while Pi represents the factor used to determine the area within a circle, by careful calculation; and drawing the problem out; it becomes apparent that Pi actually represents .785% of the area of any circle. Will this change the world as we know it? I hardly think so. But it is an example of the beauty and perfection of numbers. While I have rounded off the number to obtain this new factor, it should not pose any real problems for any calculations confined to construction, travel etc. Would I use it to build a spaceship and plan a trip to Mars? Hardly. But for the average needs of an estimator; or carpenter; this factor works out just fine. I hope someone finds this useful and lets me know! Pi for now! 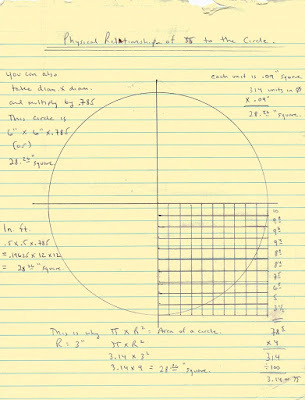 Note: Though I was able to find something about the factor .785 referenced on line; and one fellow even describes drawing a square with a circle inside the perimeters; I still find this explanation and diagram easier to follow.